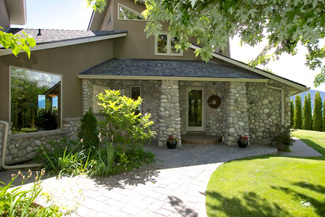 Situated on the coveted Naramata Bench, yet still within Penticton city limits, lies this one-of-a-kind 7.56 acre estate. Drive through the private gated entrance down the cedar lined driveway to arrive at the secluded home, surrounded by orchards and vineyards. Perfectly situated to take advantage of the Okanagan Lake views with Penticton beyond. The exceptional quality and craftsmanship is evident as you enter the 4600 sq.ft. custom built home. Beautiful hardwood floors throughout, chef's kitchen is complete with solid maple cabinetry, granite counters & top-of-the-line appliances. Custom spiral staircase leading to the loft with access to the south facing deck. Impressive master bedroom with 6-piece ensuite. Attached 4 car garage, separate workshop and caretakers cottage. 3.5 acres planted in apples and pears, 600 grape vines, garden and greenhouse. Approx 2.5 acres including the estate home are not in the ALR, subdivision potential. "E.&O.E. The information contained herein is assumed to be correct but is not guaranteed by the Listing Agent or Publisher and should be verified. All properties are MLS unless otherwise noted. "